The next hurdle will be €7 billion in bonds held by the ECB that mature in July and August. Greece doesn’t have the cash to repay them, and failure to do so could ultimately lead to Greece’s exit from the eurozone. Antonopoulos and her coauthors envisaged four scenarios whose macroeconomic impact is summarised in the below table (click to enlarge). 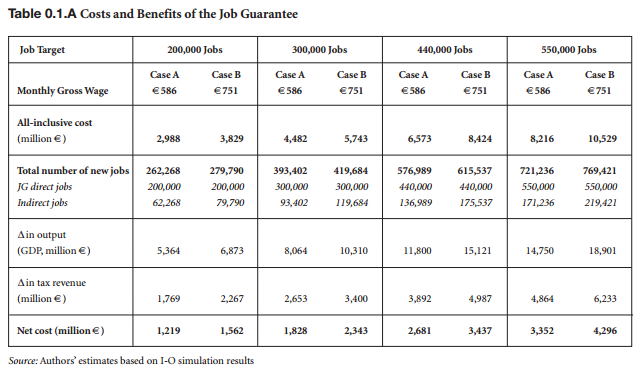 According to these figures, a large scale job guarantee program would contribute to reducing Greece’s debt/GDP ratio and could reduce unemployment by 1/3 to 1/2. It is clear that, having been appointed deputy minister for labour, Antonopoulos is in a position to enact her own proposal, funding permitting. One of the main pillars of Syriza’s economic program is the creation of 300,000 new jobs for the unemployed under a direct public employment scheme. Such a program will provide relief for a sizable percentage of the long-term unemployed, will boost demand as the newly employed will increase their consumption, and will increase government revenue through the collection of additional direct and indirect taxes provided by the newly employed. A program sized at 550,000 jobs at a €751 wage would have a €10.5bn gross cost. These funding sources also answer the general question of how the Greek government can finance itself, independently of the existence of a job guarantee program. Central Bank participation as envisaged in some of the proposals may not be necessary, or even possible under EU treaties. Of the above funding sources I will now focus on the most unconventional one, the issue of tax-anticipation notes. Being zero-coupon, perpetual, bearer assets, these could function as a parallel currency. Rob Parenteau, a colleague of Antonopoulos, has proposed just such a scheme to exit austerity without exiting the Euro. To accomplish this, the following alternative public financing instrument may need to be unilaterally adopted in each peripheral nation in the eurozone. Federal governments will henceforth issue revenue anticipation notes to government employees, government suppliers, and beneficiaries of government transfers. These tax anticipation notes, which are a well known instrument of public finance by many state governments across the US, will have the following characteristics: zero coupon (no interest payment), perpetual (meaning no repayment of principal, no redemption, and hence no increase in public debt outstanding), transferable (can be sold onto third parties in open markets), and denominated in euros. In addition, and most importantly, these revenue anticipation notes would be accepted at par value by the federal government in settlement of private sector tax liabilities. The revenue anticipation notes could be distributed electronically to bank accounts of firms and households through some sort of encrypted and secure system, or they could be sent as certificates, preferably in denominations of 50 and 100 euros, to facilitate their possible ease of use in other transactions, should private agents elect to do so. Essentially, the government is securitizing the future tax liabilities of its citizens, and creating what amounts to a tax credit that will not be counted as a liability on its balance sheet, and will not require a stream of future interest payments in fiscal budgets. A parallel currency needs a sufficient penetration in order to gain generalised acceptance as a means of payment. Thus, the question arises what government expenditures, in addition to a job guarantee program, could be used to disperse a parallel currency among the population. The overdue obligations of the government to the private sector reached €4.22bn in October 2014 compared with €4.068bn in September. In the same month the outstanding tax refunds remained stable at €718 against €713 the previous month. Such arrears could be monetised by paying them off with tax anticipation notes. Question: My first question would be, it’s not actually very explicit here in the press release whether that means that you’re not going to buy into Greece’s debt right now. Second question would be whether you’re also considering buying bonds which are actually already trading in negative territory when it comes to yields. Draghi: Second question, the answer is yes. And to the first question, let me say one thing here. We don’t have any special rule for Greece. We have basically rules that apply to everybody. There are obviously some conditions before we can buy Greek bonds. As you know, there is a waiver that has to remain in place, has to be a program. And then there is this 33% issuer limit, which means that, if all the other conditions are in place, we could buy bonds in, I believe, July, because by then there will be some large redemptions of SMP bonds and therefore we would be within the limit. And by the way, let me add, if there is a problem, if there is a waiver, all these are not exceptional rules. They were rules that were already in place before. So we’re not creating. However, if in the next six months the Greek government were to make payments in the amount of €7bn with Euro-denominated scrip as opposed to ‘hard’ Euros, it would accumulate an equivalent amount of Euro reserves which could then be used to redeem the bonds held by the ECB. Greek government final consumption expenditures are roughly 20% of GDP, or between €35bn and €40bn annually. The needed €7bn to be paid in scrip would then need to be 35% to 40% of government expenditures for a 6-month period, which is large but not implausibly so especially as a one-off. Gresham’s law that “bad money drives out good” would imply that, as soon as scrip begins to be used in the Greek economy, ‘hard’ Euros would be hoarded and scrip used in preference to make payments. Thus the stock of Euro banknotes would cease to circulate and would have to be made up by an equal face value of scrip to avoid deflation of the M0 money supply. it would be issuing a total of €16bn in scrip, commensurate with the amount of Euro banknotes in circulation in the Greek economy. One of the principal motivations for the introduction of a parallel currency is the preservation of government hard-currency reserves, which would be defeated by the capital flight one might expect would be triggered by the introduction of the parallel currency itself. To contain this risk, capital controls would appear to be necessary. Fortunately for Greece, the Cyprus crisis of 2013 demonstrated not only that capital controls are compatible with Eurozone membership, but the willingness of the Eurogroup to introduce them as a lesser evil. It is quite possible that the market panic triggered by Syriza’s accession to power will precipitate a solvency crisis and the need to institute capital controls before, and not after, the Greek government has had time to enact any of the policies outlined above. In that case, the introduction of capital controls Cyprus-style would precede the rollout of a parallel currency which would then appear to be an emergency measure addressing capital flight. The Argentinean experience is important. Argentina had approximately 17 parallel currencies in 2001-2002. 1 was a national parallel currency (Lecop) and the rest were state currencies. In my recollection, only 2 parallel currencies managed to maintain parity, or be near parity: the national one, and the one of the main province (Patacón, of Buenos Aires). Perhaps some other province managed as well, but many others experienced huge devaluations of their parallel currencies, which were trading at 50 to 30%. It might be a short term solution, but I doubt it is a long run alternative. And certainly not if a Grexit is anticipated. If the local currencies were not accepted outside their respective states it stands to reason that only the federal parallel currency (and the Buenos Aires one given the region’s weight in the national economy) would trade at anything near parity. With tax arrears of €74bn and government arrears of €4bn (including €700m in overdue tax repayments) out of a GDP of €182bn (25% below peak), any expansion of the money supply, and any opportunity to improve income in order to pay taxes, is likely to be welcome and boost output and tax revenue. And I’m estimating something of €20bn for the amount of TAN in circulation for the first year or so. If the Greek government agrees to accept the TANs (tax anticipation notes, or what you refer to as a parallel currency) as payment for taxes at a one TAN = one euro exchange rate, arbitrage should insure euros keep circulating, rather than getting hoarded. Euros will still be needed to settle international transactions in any case. In the extreme, it might not be such a bad thing if TANs become the primary means of settlement in Greece, as then Greece will have a greater degree of both fiscal and monetary sovereignty…all without exiting the euro. There are a number of “ultraperipheral” European countries with their own currencies where people save in Euros. A notable case is that of Croatia where the exchange rate is on a dirty peg. People indeed hoard Euros, both in the form of cash and Euro-denominated bank deposits. In fact this is a continuation of the old practice of using Deutsche Mark as the store of value in the 1980s and 90s. I am guessing that the “market” exchange rate of TANs might fluctuate away from Euro parity but not too far away, the reason being that TAN value is anchored at parity at two points in time: the time of issue by the Greek government, and the time of redemption in payment of taxes or fees. And since there is a tax payment date at most 12 months ahead at any point in time, the TAN exchange rate can never drift too far away from parity. Is that what you mean by “arbitrage”? The whole point is that TANs become the primary means of settlement in the local economy, of course. The question is whether TANs should be electronic or paper and in so far as there may be large parts of the Greek economy which are not ‘bankarised’ and operate on a cash basis currently (the mountainous or island hinterland comes to mind) the issue of paper certificates in denominations of 5, 10 and 20 euros might be preferable. There is some good research along the lines of your first point. Here is one paper that may be relevant: http://www.veblen-institute.org/IMG/pdf/a_plea_for_a_european_monetary_federalism.pdf. The case of Argentina early last decade is especially informative on the use of parallel currencies in private transactions. By arbitrage I mean if the government stipulates TANs or euros are acceptable to pay taxes at 1 TAN = 1 euro, you will want to pay your tax liability with TANs if TANs somehow lose value relative to euros, thereby creating more of a demand for TANs, which should tend to bring the TAN back to 1 TAN = 1 euro. As long as you have some major institution willing to receive 1 TAN = 1 euro, and you have to pay that institution one way or another, and that institution has very little limiting its ability to receive TANs as a means of settlement (here it would be political limits to raising taxes, for example), you will tend to have private agents trading in such a way as to preserve the 1 TAN = 1 euro exchange rate. On electronic vs paper forms, one advantage of the former is that it becomes harder for the Troika to challenge the TANs as “banknotes”, which various legal tender clauses in the Treaties prohibit without ECB authorization (see Article 128 in Treaty of Lisbon, I believe, as an example of this restriction: see http://www.lisbon-treaty.org/wcm/the-lisbon-treaty/treaty-on-the-functioning-of-the-european-union-and-comments/part-3-union-policies-and-internal-actions/title-viii-economic-and-monetary-policy/chapter-2-monetary-policy/396-article-128.html). Of course you could issue TANs as physical notes in various convenient denominations and argue they are just like any bond certificate (they just happen to be perpetual, zero interest bonds…which is essentially what a currency is, but we tend not to think of it that way). Or you could argue Article 128 only applies to euro banknotes, as stated in its first sentence. The point is to get the alternative financing instrument up and running, and buy enough time with the legal system, that you could demonstrate its effectiveness, making it essentially a politically irreversible reform. Or so one might hope.